This talk looks beyond origami as a childhood pastime and an art form and instead, explores origami as a source of many interesting mathematical problems, including one called the fold-and-cut problem. The fold and cut theorem states that it is possible, given a piece of paper and any polygonal shape, to find a series of folds of that paper such that the given shape can be generated with a single cut. This talk explores two proofs of the theorem and a Ruby implementation of a solver that determines the correct series of folds given any input polygon. There will be a live demo of the program and paper cutting! Amy is a technologist/artist who cares about STEM and STEAM education and making the world better through human-centric design and technology. 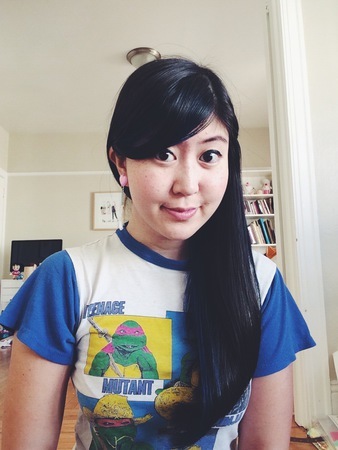 She is the founder of Bubblesort Zines—zines that explain computer science concepts via drawings and stories. Previously, she was a web dev at airbnb, machine learning research at Honda Research Institute in Japan and HCI research at the University of Tokyo.